Crowdfunding holds the tremendous potential of propelling a humble creative pursuit into a massive global success by opening doors to instant worldwide exposure and funding opportunity, never before possible with conventional capital raising procedures. Crowdfunding, a fast-rising fundraising and investment platform, has an enormous potential to be a valuable tool for social good organizations such as social enterprises, non-profits, benefit corporations, ethical fashion designers and other fair trade organizations in building meaningful and productive engagement, spreading word about their initiatives, expanding their donor, impact investor, and supporter bases, and increasing their overall funding and impact. When done correctly and methodically, a crowdfunding campaign can build momentum for any project and, ultimately, catapult it to success. Running a campaign may be time- and effort-intensive, but has the prospect of yielding notable returns; and, mind you, we are not only talking about money, there are social and environmental impacts involve here. So, how does nascent and existing non-profits appropriately launch a crowdfunding campaign? First, it is advisable to launch a crowdfunding campaign only for projects that have already received support from present donors or benefactors before even making it open for public investment. Prior to launch, a campaign for an initiative or a project must be promoted for at least a couple of weeks and shall already have a dedicated committee tasked to oversee its development and success. Post-launch, studies show that fruitful campaigns have a target of reaching 30% of its funding goal in the first 48 hours. A Social Good organization should only look to expose the project to a wider audience only after surpassing the 30% mark. Why do existing supporters play such a prominent role in the success of a crowdfunding campaign? The endorsement or donations of current benefactors will serve as a testament to a non-profit organization’s credibility or a social entrepreneur’s project viability, which in turn can entice new contributors to come on board. Some initiatives, for instance a recent campaign launched by Lensational, a start-up social enterprise managed by London School of Economics’ graduates, seek the support of noteworthy investors or venture capitalists to attract other funders to follow suit for their social cause in Asia. Another example is the funding of Martin Luther King Jr. International Chapel, home of the largest weekly gathering of young black men in America, to raise eight million dollars. More than money, a commendation from significant entities can boost the integrity and sincerity of a campaign. There are other motivating factors that secure the success of a crowdfunding campaign. Besides the backing of existing supporters, a campaign should also be inclusive, relatable, relevant and rewarding. By inclusive we mean that potential funders or supporters should ideally be given an active role in the development or fruition of a project. For example, they can be allowed to suggest the next location of an educational drive, additional services of a purpose-driven marketing agency or colors of an eco-friendly apple watch accessories. By being able to contribute more than money to a project, these would-be supporters will feel part of something bigger than themselves and thus be more motivated to participate. A project and/or a social entrepreneur should be close to the heart of the targeted supporters. Studies suggest that people are more likely to support a campaign if they can relate to its social and environmental cause. Parallel to this, a project must also be credible and should appeal to its audience’s desire of fulfilling its purpose. Naturally, perks also motivate people to support an initiative. Rewards for funding a project can take the form of products from the initial production run, an amount of money from a project’s revenue or even a level of shareholding in the proponent organization. Crowdfunding represents more opportunities than just money to a fledgling business social enterprise, a start-up benefit corporation, a budding non-profit organization or other charitable and philanthropic institutions. Crowdfunding has the capacity to mitigate a wide range of risks faced by purpose-driven organizations, profit-for-purpose and non-profits alike. Quite obviously, crowdfunding eases the pressure off funding, because it allows a project or a business to be pitched and exposed to millions of potential investors all at once. It also diminishes market risks, as the support and affirmation of a notable number of individuals vouch for the merit and saliency of a project. Most notably, crowdfunding dissipates the execution risk, mainly associated with launching a new product. As discussed above, an organization leading a crowdfunding campaign can allow its audience of prospective investors to actively participate in the development of a product or project. These people’s input, be they praises or constructive criticism, can serve as a form of “market research” for the proponents. The information can be used to determine the specifics of a product, like its size, features or packaging, which can contribute to reaching optimal demand. Owing to the risk-reduction feature of crowdfunding, it is gradually being incorporated into pitches and presentations for traditional financing entities among non-profit organizations. Before the dawn of modern crowdfunding, the risks mentioned above remained to be unknown during the funding stage of a project. Today, results from a crowdfunding round are used to solidify the arguments of market interest and viability, and to ascertain the overall amount of capital needed to develop and launch a project or a product. 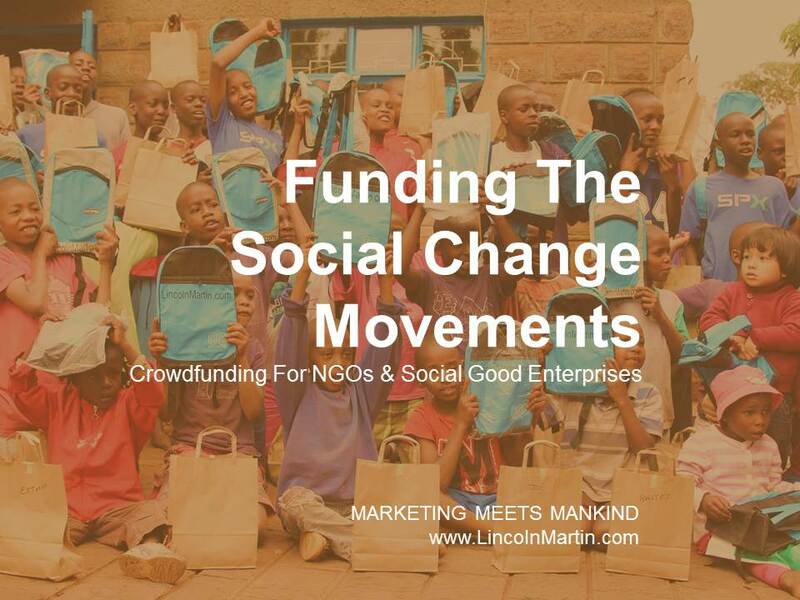 Crowdfunding, with its superb leveraging of technology and social media connectivity and community, affords #SocialGood entities benefits and advantages unimaginable until a few years ago. It holds the tremendous potential of propelling a humble creative pursuit into a massive global success by opening doors to instant worldwide exposure and funding opportunity, never before possible with conventional capital raising procedures. But while crowdfunding may seem for some to come in stark contrast with traditional fundraising methods, it has an excellent potential to fill in a gap in the existing funding and investment process. This, then, leads to a completion of a reciprocal relationship among social entrepreneurs, crowdfunding sites, the audience and traditional financing entities.